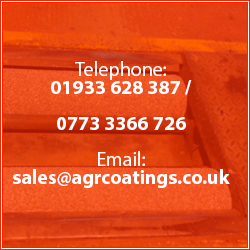 The work AGR Coatings carries out involves re-surfacing the rollers on an MOT brake test machine. This work is carried out due to the surface wearing away from constant use or as a result of materials being trapped in-between the rollers. This results in the surface being torn from the drum leaving patches which will give false readings. Repair work is carried out in-situ this involves removing the worn coating from the drums and then grinding out any rust ensuring the drum is back to bare metal. The drums are then cleaned removing all particles of dust as well as applying heat to remove all dampness. A high quality resin is then coated to the drums along with anti-skid road grit. The machine should then be left out of use until the following day (or at least 16 hrs). The surrounding area is then cleaned, removing all dust and rubbish. This is a very noisy process dust masks and ear protection must be worn by anyone working in the same area. Work is carried out on class 4, class 7 and commercial machines, the time scale depends on the size of the machine, approx. 3-4 hrs for class 4 and 5-7 hrs for class 7 and commercial machines. There is a guarantee supplied for the work carried out, 1 year for class 4, on average the new surface will last approx. 4-5 years. A 6 month guarantee for class 7 and commercial which will last approx. 3 years or longer. We offer highly competitive rates and work will be carried out to suit the customer needs (am/pm, weekends) to help avoid disruption to day to day workings. Please do not hesitate to contact me for a quote or further information. To contact AGR, please use the contact page on this website. AGR provide a cost effective service to MOT test centres by resurfacing Brake Test Machines. We travel nationwide to re-surface and re-grit Brake Test Machines including Class I & II, Class IV, Class VI and Commercial machine types.